Winter has been a bit slow to move in to many parts of the country this year. However, freezing temperatures, snow and ice means that planes have to be de-iced before taking flight, so here's an explainer of aircraft deicing, why it's done, and the different methods used. The first thing to know about aircraft deicing is why it is done. It's not just to get snow off so that people can see the name of the airline better. In fact, it's snow or ice on the fuselage itself doesn’t matter nearly as much as the parts of the plane known as “critical areas.” These areas include the wings, horizontal stabilizers, and vertical stabilizer (tail) which must be free of contaminants in order to take off safely. A buildup of ice or snow on these surfaces not only adds extra weight, but most importantly, it also disrupts the flow of air, which reduces lift. On January 13, 1982, Air Florida flight 90 failed to gain altitude on takeoff, stalled, hit a bridge and crashed into the icy Potomac river shortly after taking off from Washington D.C.'s National Airport. The official cause was ruled to be pilot error, as the pilots failed to turn on the engines' internal ice protection systems. While rolling for takeoff, the pilots' instruments told them they were going faster than they actually were. After the crash, it was also discovered that the deicing fluid was diluted to 18 percent, when they should have been using a thicker mixture. 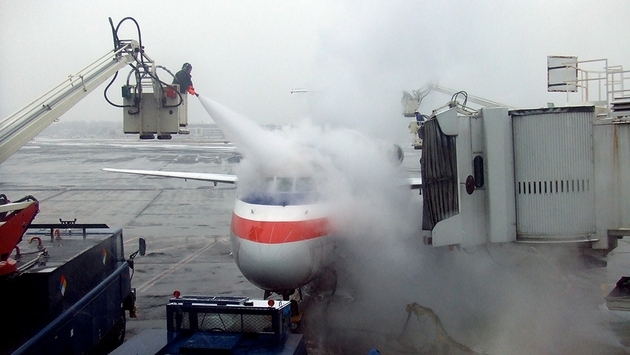 At many airports, deicing is done away from the gate at an area called the deice pad. This is done for a few reasons. 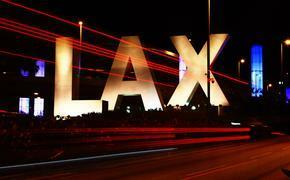 First, airlines don't want their planes sitting at the gate any longer than they have to. If another plane is waiting to come into that gate, deicing a departing plane will only slow that process down. Second, deicing fluids deplete the oxygen from water, and airports don't want the fluids going into the stormwater drains. So at the deice pad, the fluids drain into a special tank or reservoir. Third, deicing fluid is very slippery, so it poses a safety hazard for people walking or working in the area. Finally, airport gates are often congested by other ground vehicles, so it's easier for the deice trucks to move around freely out at the deice pad. Once a plane is pushed back from the gate, the pilots taxi the plane to the deice pad. A dedicated radio frequency is used so that the pilots can tell the de-ice crew exactly what they want done to the plane. Some airlines use their own employees to deice planes, and some hire contractors. Not all deicing is the same. If there is no precipitation falling, and a plane just needs some residual frost, snow, or ice removed, the crew will use what's called a one-step procedure. Deicing fluids are colored, to make it easier for the person spraying the plane to see where the fluid is being applied, and to allow them to see if the full area has been treated. In the one-step procedure, a heated orange fluid called Type 1 (also known as Glycol) is sprayed evenly over the affected areas, melting whatever was sticking to it. Type I is mixed with water, usually at a ratio from forty to sixty percent, and smells a lot like maple syrup. The mixture can be diluted or thickened, based on the outside air temperature. Deice fluids are applied methodically, from the wing's leading edge to the trailing edge, beginning at the wingtip and working back toward the wing root (where the wing is joined to the fuselage). The same is done to the horizontal stabilizers. For the tail, they go from front to back, starting at the top of the tail and work their way down to the base. Anywhere from one to four deice trucks can be used to deice a plane. If there's a lot of snow or ice on the fuselage itself, they will spray it beginning at the top of the plane, just behind the cockpit, working their way toward the tail. When freezing precipitation is falling, a two-step procedure is used. After completing step one, they repeat the process, switching to an anti-icing fluid called Type IV. Type IV is green, thicker, not heated, and is used to protect the critical surfaces from accumulation of frozen precipitation while the plane waits to take off, which can take quite a while at some of the major airports. This fluid slides off the wings as the plane takes off. Hopefully, this gave you some insight into why deicing is done, and what they're actually doing out there when you see the plane being sprayed. And when you're watching those folks work, be thankful that you're inside that cozy cabin, even if you're cramped into a middle seat. You're still more comfortable than the airline employees working outside in the elements.